This review completed, and graciously shared by the team at The Institute for Civility . The title of this book is accurate – especially the word “short”! Mark Caldwell wrote A Short History of Rudeness to poke some fun at those of us who ask the question: “Where have all our manners gone?” It’s an interesting history that he paints. So what is rude? What are manners? Are they always the same? Do all people ascribe to the same principles? Not all manners are correct in every situation. Depending upon who you are speaking with, manners take on different understandings. If you don’t agree, perhaps this book will shed light on this subject. A Short History of Rudeness has two parts: public life and our private lives. In public there are certain codes of ethics the author discusses. For instance, if someone opens the door twice for another person, what’s the right thing to do? Say “Thank You” twice, or would just once suffice? The author suggests it’s up to you to decide. Yet the book is not about giving advice. Rather it discusses how we all need to become aware of our surroundings so that we can be more civil with each other. The bulk of the book contains five chapters dedicated to encounters in our public life. Examples are given of manners in our general life, mobile life, work life, and at two critical stages of our lives: when we get married and when one dies. Finally the fifth chapter describes manners in our mass communications. It’s interesting to learn that through the ages, manners have come and gone. What we define as good manners has changed greatly as time has passed. Not so long ago, professionals always wore a suit and tie to work. But look at the change! Many professionals now work at home in their T-shirts! Each time a new technology comes into popular use, our world goes through a time when we discover the proper and improper use of the new discovery. For example, the telephone was revolutionary in its time. What was the proper way to cut into a conversation when one shared a phone line with another party? Now the computer has revolutionized our world. Do you remember when we had to agree to certain rules about when and how to use a chat room on our PC’s? Manners – they matter. Yet we don’t always agree on what is or is not the right way to do things. The latter half of the book is about manners in our private lives. The author is clear that the ground rules there are up to the individuals in each home and/or business. This book is interesting. It is short and to the point. While it covers a wide variety of situations, it confesses that it is not an all encompassing study of manners. The author ends the book with a very realistic statement that manners only work when we the people choose to accept them. If people don’t care about manners, manners disappear for awhile. Through history though, manners have a way of returning. As the Institute grows, perhaps manners will return a little more quickly than they otherwise might. About the Author: Mark Caldwell teaches at Fordham University. 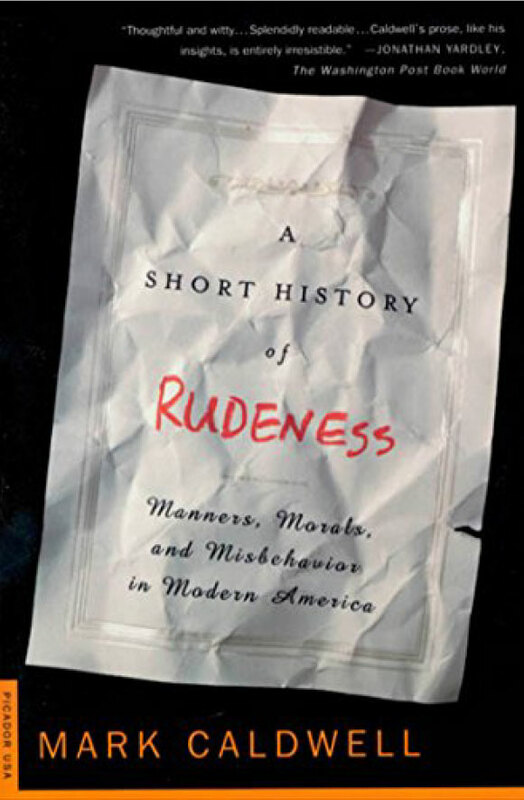 A Short History of Rudeness is published by Picador USA, New York, New York, 1999.